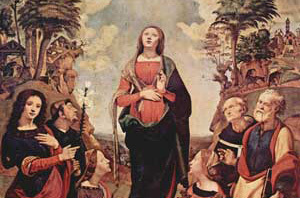 The Feast of the Immaculate Conception in Italy is celebrated on December 8th each year. It celebrates the belief that Jesus's mother, Mary, never sinned throughout her entire life. In Italy it is celebrated with a feast for the Virgin Mary and a mandatory church service. Some places such as schools, banks, post offices, and governmental offices will be closed. This holiday is based off the bible who says that Mary's mother, St. Anne, had an angel had spoken to her and told her that her child would be honored by the world. It became a national holiday in 1854.